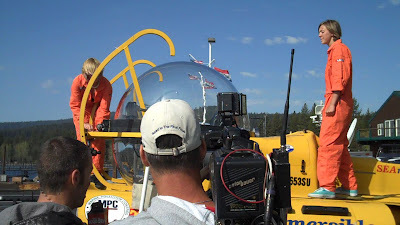 Madi and Scott prepare for their first descent in the SeaMobile, Emerald Bay, Lake Tahoe. Sid drives the sub and deflates the ballasts. It was "Youth Day" in Emerald Bay last Sunday, 5-17-09. 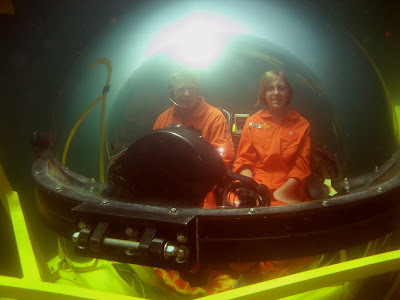 Sid Loomis (L) and Madi Ordway (R) are the Undersea Voyager Projects Youth Ambassadors for the Lake Tahoe expeditions. The youths have learned how to drive and submerge the submarine, care for the vehicle and the use of the life support system with proper communication skills to bottomside. Madi and Sid listen to Scott Cassell's interview on "Good Day Sacramento" at the Tahoe City Marina. 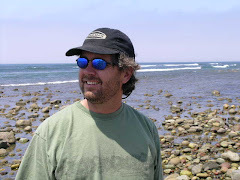 Mark S. Allen interviews Scott Cassell. Madi and Sid get their 30 seconds of fame when they get interviewed for the "Good Day Sacramento" segment. Madi and Sid do some post dive inspection work for a cut-in on "Good Day Sacramento". Madi and Scott 30 feet deep in the Sea Mobile checking out the wrecks of Emerald Bay. Madi and Scott in Emerald Bay. In 1969, Emerald Bay was recognized as a National Natural Landmark by the federal Department of the Interior. In 1994, California State Parks included the surrounding water of the bay as a part of the park, making Emerald Bay one of the first underwater parks of its type in the state, protecting the various wrecks and other items on the bay's bottom. 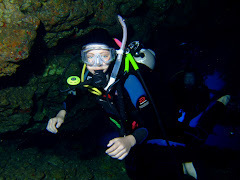 Madi shot this short video with the Flip camera from the inside of the Sea Mobile in Emerald Bay. Madi, on the far right, scuba diving with the UVP. One thing she wanted to do was to hold on to the sub and let it tow her around. 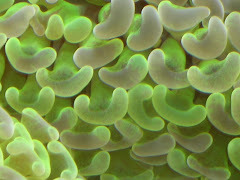 Reef Life: Vol. One, Number One - Now Available ! I recall the way I felt in February 2004 reading then publisher Leng Sy's Coral magazine. Looking at the great photographs in awe and reading each and every article with the purpose of learning. 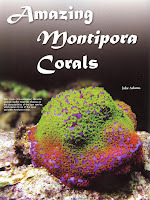 It was a publication that the reef hobby desperately needed. 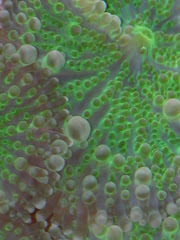 I have every issue of Coral magazine and have enjoyed reading it immensely. Late last year Leng severed ties with the English translation of the German publication Koralle and ventured out with his own project, Reef Life. Today, Coral magazine is being published by James Lawrence and continues to thrive. Reef Life will definitely compete with Coral, but in my business and the way I use these publications as gifts to my clientele, they will compliment each other. 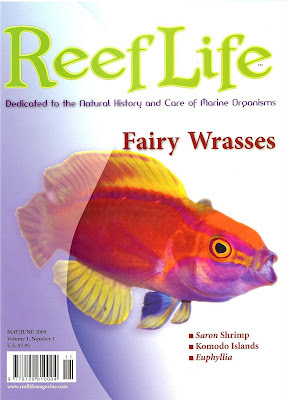 Today I received my clients copies of Reef Life and will start distributing tomorrow. Although I have yet to read a single article, my opinion is that this publication far surpasses the old Coral in photography and content. Leng kept his past editor Kathleen Wood and she has put together a fine list of contributing authors. Roger Steene, Hiroyuki Tanaka M.D., Scott W. Michael, John Hoover, Charles Delbeek, Tristan Lougher, James Fatherree and Jake Adams all have incredible articles in this first edition. If I were to have a single complaint, which really doesn't qualify as a complaint but rather an acknowledgment; Leng needs to find some more advertisers! With this being the first issue, I am sure sellers will be grinding to get their ads in next issue. Great job to all that are affiliated with this new publication! The U.V.P. group will be in the Tahoe/Fallen Leaf Lake area for the month of May and now that the introduction of the sub to the Tahoe waters is over, it is now time to get down to work. Today the sub will be in Fallen Leaf Lake working with scientists from Scripps Institute of Oceanography. Tomorrow will be spent a half a day with the Scripps group again on Fallen Leaf Lake and then moving back to the Tahoe Keys and working with the Tahoe Regional Planning Agency looking for invasive species. I dove with my friend Jerry Burawski, High Camp Food & Beverage Manager, Squaw Valley (left) and unfortunately we were a bit too late getting in the water to join the SeaMagine on its descent. 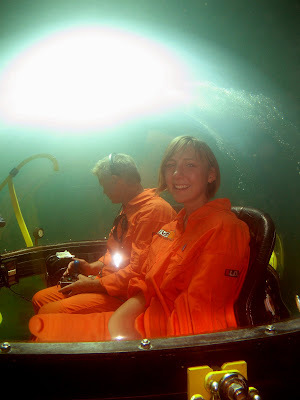 By the time we entered the water the submarine was already in 85 feet deep water. Our mistake. We're rookies at diving with submarines. I take that back, Madison and myself had the experience of seeing a tourist submarine come by when we were doing a drift dive on the Barcadera Reef, Aruba. We plan on joining the group again and do the Emerald Bay wreck dives that are located in 20-30 feet of water that will put us within site and swimming distance of the submarine at all times. Remarkably, I was not the least bit cold diving in the 45 degree water surface temperature. And when I got out, I pulled my wetsuit down to my waste and kept my upper body warm with multiple layered clothing. I purchased a Flip Video Mino 720p HD Camera last week to add video to my blog. This thing is great! Although it only has a 4 GB hard drive which equals one hour of video, it is High Definition quality. No bigger than a standard cell phone, it's a great tool to have in the camera bag and use when I want to document something. The Flip comes with a simple to use software program for editing, making snapshot images and adding music to the video's an ease. It's just a fun camera to use and the quality is acceptable. I am not trying to make an IMAX movie here, that crew will be in the water next week with the UVP group. 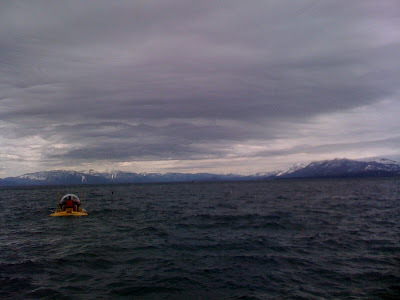 On Thursday, April 30th, 2009 the Undersea Voyager Project officially got underway with their underwater studies of Lake Tahoe at the Tahoe Keys Marina, South Lake Tahoe, CA. A press conference was held which introduced the members of the UVP and the working team from the Tahoe area. 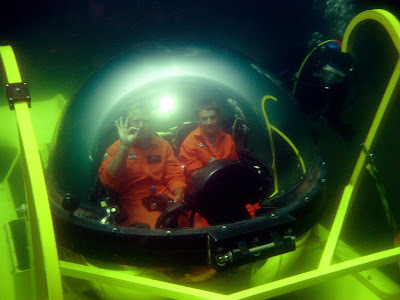 The submersible "SeaMagine" did a short test descent after the introduction. From L-R, Syd Loomis, South Lake Tahoe Student Ambassador, Scott Cassell, President/CEO of Undersea Voyager Project and Tahoe Regency Planning Agency Communications Director Julie Regan. A major portion of the press conference and the studies of which the Undersea Voyager Project are going to partake, include the invasive Quagga and Zebra mussels that have the possibility to invade Lake Tahoe. Quagga mussels were discovered in the US in Lake Mead, Nevada in 2007. The mussels originate from European waters. Quagga mussels have also been found in Lakes Mohave and Havasu in the Colorado River, and in the Colorado River Aqueduct System which serves Southern California. Surveys in August 2008 found Quagga in Lake Dixon and San Vicente Reservoirs in San Diego County. One Quagga Mussel can lay a million eggs and there is no eradication. 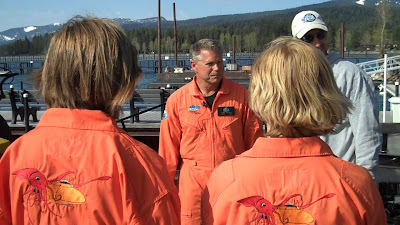 Chris from the Tahoe Resource Conservation District inspects the SeaMagine. New this year on the lake, all public boat ramps will be manned with an inspector to perform a $35 dollar mussel inspection. In addition, all private boat ramps must have an inspector to check every boat that enters the lake. The fee would be a one time cost to someone who only boats in Lake Tahoe. Lake Tahoe does not have ANY Quagga mussels and strict inspection procedures and the cooperation of the people that use this gem will prevent their introduction. The Undersea Voyager Project will study other invasive species that currently occupy the lake, the Asian Clam, Eurasian watermilfoil algae, Largemouth Bass, Black Crappie, Bluegill, Brown Bullhead Catfish and will be on the look out for the Goldfish (Tahoe Tessie too!). From the Lake Tahoe Basin Management Unit of the US Forest Service; "Please do not dump your goldfish into Lake Tahoe! Native to Asia, goldfish have been introduced worldwide due to their popularity as pond and aquarium fish. Releases, both intentional and unintentional, have meant that this species has formed wild populations in many locations. Goldfish impacts on the aquatic community include increasing turbidity, predation upon native fish, and helping to facilitate algal blooms. Goldfish are among the most destructive non-indigenous species in North America, primarily because of their diet of aquatic vegetation. 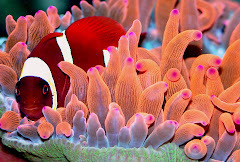 They strip waters of oxygen-producing plants which increases water temperatures and destroys habitat for native juvenile fish. In addition, the feeding habits of goldfish stir up sediments, which leads to a decrease in water clarity and inhibits plant growth. If goldfish populations get large enough we will see a further decline in the shorezone clarity of Lake Tahoe." Here is a video from the Arizona Game & Fish that dictates the proper procedure to eradicate the mussels from a boat. 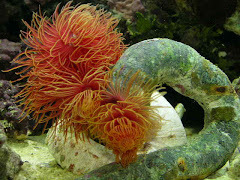 Click this link to see the first part (30 minutes) of a video produced by the Pacific States Marine Fisheries Commission with support from the U.S. Fish & Wildlife Service on the "Don't Move A Mussel" campaign. The children of Lake Tahoe School, Incline Village, NV made the trip over to The Keys to admire the submarine and learn about youth sciences. Scott Cassell has said repeatedly in many of his community talks last week about how important it is to engage children in the Undersea Voyager Project and the study of Sciences. 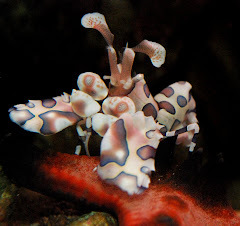 There will be an Undersea Voyager Project Youth Day on May 17th at Obexer's Marina, Homewood,CA and all local children are invited to attend. Will Kohnen, Owner and Designer/Builder of SeaMagine, Scott Cassell, President/CEO of U.V.P., and Peri Best, Public Relations Officer prepare for the descent. 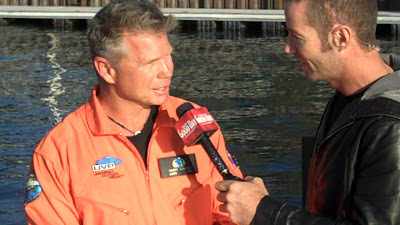 Scott Cassel releases the air from the ballasts for SeaMagine's descent. 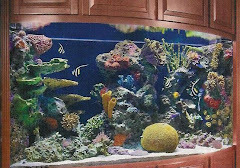 Note from Robert: For those of you that come to my website on a regular basis, I promise that I will get back on track with posts dedicated to my occupation and the aquarium trade. This project that is happening in Lake Tahoe is a very historical event to me and many in my community and I hope that my readers find it interesting. Monday will be our first dive with U.V.P. departing from the Tahoe City Marina and with the rain predicted, water surface temperatures at 45 degrees, I am quite certain that my daughter Madison will attempt to find a way to get into SeaMagine rather than diving. We were asked to come up with the dive location and I will suggest either the Stateline Wall which is composed of giant granite boulders stacked on top of each other, forming a wall. The Stateline Wall is located about 1300 feet west of the CalNeva Lodge in Crystal Bay, NV. The depth drops to over 800 feet with over 80 feet of visibility. Or possibly the wrecks at Emerald Bay which would put us in warmer surface (+2 degrees!) water and shallower diving. I also hope to get the crew over to the Glenbrook area where there is a large amount of construction debris in the lake from the 1800's logging industry that took place in the area.